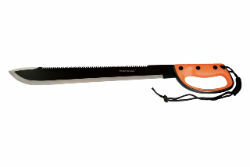 Whether you exploring the Amazon jungle or working on the farm, you will be prepared with the Jungle Expedition Machete. This machete is designed with addition features like no other. Need to saw through a thick branch...No problem. The sawtooth back has you covered. The full tang 18" blade is made of high strength 440 stainless steel with a non-stick black coating. It is perfectly weighted so you can deliver a powerful blow with every chop. The ergonomic injection molded D Handle adds an additional layer of protection your fingers. Also included is wrist lanyard and heavy duty nylon sheath.